BRUSSELS, Belgium -- The European Union’s executive backed Ukraine and Georgia’s bid for visa-free access to the bloc on Friday, opening the way to more than 40 million people to potentially travel visa-free to the bloc. 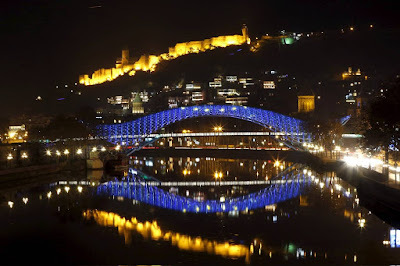 A foot bridge over the Mtkvari river is illuminated in the colors of the European flag in front of the ancient Narikala Fortress in Tbilisi, Georgia. The European Commission said on Friday it backed visa-free travel for Georgia and Ukraine and would propose a visa waiver next year for citizens of the two ex-Soviet countries to travel to European Union member states. The European Commission said both countries had carried out the reforms they promised to enact to win Brussels’ backing and they planned to make the formal legal recommendation in early 2016. It will then be for EU governments and the European Parliament to sign off. At a news conference on Friday, European Commission President Jean-Claude Juncker said he pushed EU leaders at Friday’s summit to make “rapid decisions” on the visa-free requests. In the past, he has expressed confidence that the bloc’s 28 governments will approve Brussels’ decision, but with the EU facing its biggest migration crisis in decades, some diplomats have warned there could be a protracted debate among capitals next year. The concerns about migration deepened after the Paris terror attacks in November, which further weakened confidence in the bloc’s oversight of its external borders. With some EU leaders, including German Chancellor Angela Merkel, warning that the EU document-free Schengen travel zone is under threat, diplomats warn there may be far greater caution about expanding visa-free travel despite Brussels’ backing. Ukraine’s visa-free bid has been one of the top goals of President Petro Poroshenko’s government, which has had to tackle a major economic and financial crisis and a bloody conflict in the east with pro-Russian separatists. Talks in Brussels on Wednesday opened up a deal on Kiev’s visa-free bid. The EU was pressing Mr. Poroshenko and his government to complete two crucial anticorruption reforms, including setting up a properly staffed and resourced asset-recovery agency to fight past and future cases of corruption. Brussels also wanted more done to strengthen the independence of Ukraine’s new anticorruption prosecutors office. In the end, the commission agreed to back Ukraine’s bid, which will allow its 40 million citizens to enter the bloc without a visa, but made it clear it will only start the legal work on its positive recommendation when these final issues are resolved. “The hard work towards achieving this significant goal has paid off,” Commissioner for Migration Dimitris Avramopoulos said Friday. “Now it is important to keep upholding all the standards. Despite the progress, EU officials have grown increasingly concerned about the political conditions in Kiev in recent weeks. In addition to facing an increasingly hostile parliament, there have been growing tensions between Mr. Poroshenko and Prime Minister Arseniy Yatsenyuk and public clashes between top officials. On Georgia, the commission gave a clear bill of health, saying the country had “undertaken all the required reforms” needed for the EU. The move will go some way to assuage disappointment over Georgia’s failure to move its North Atlantic Treaty Organization bid forward. It also comes after Russia, which backs Georgia’s separatist regions of Abkhazia and South Ossetia, has suggested it may reopen visa free access for Georgia’s citizens, one of the first signs of a thaw in relations since the two countries clashed in a 2008 war. 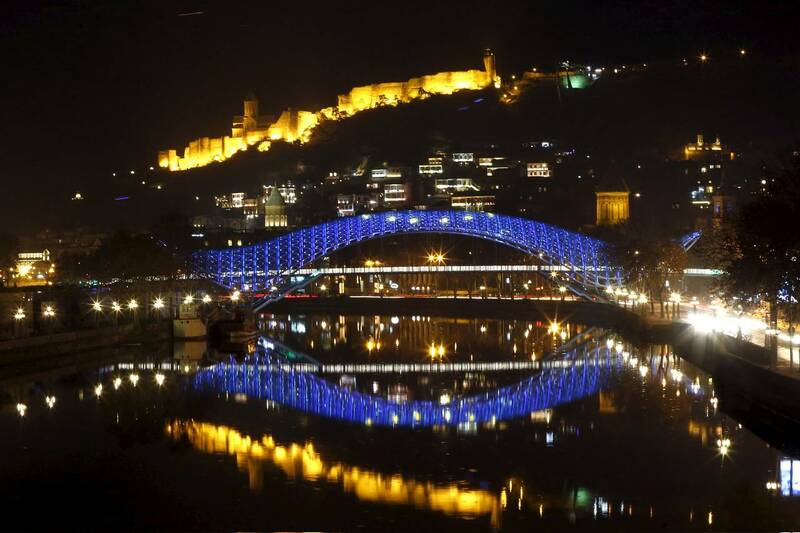 The commission also published on Friday its overview of Kosovo’s progress toward meeting its visa-free bid commitments. The EU said Kosovo must still complete action in several areas—including ensuring its judicial system is well enough staffed and effective in prosecuting organized crime and corruption, as well as ensuring independent oversight in the awards of public contracts.